Set 1924 was released in 1983 and was available only in the USA. 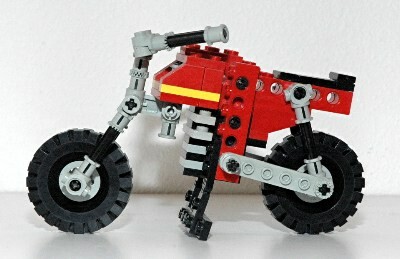 It was by far the smallest Technic set to date, and was actually available to order from cereal boxes in some places. This motorcycle is short on features, but this is not surprising for its size. 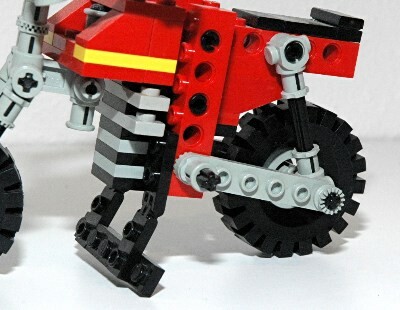 The front fork is steerable, and the kickstand can be retracted. Toothed connectors are used extensively in construction. 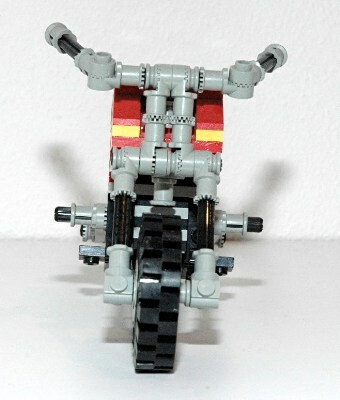 It is safe to say that this motorcycle did not break any new technical ground, but it is nicely proportioned for its size and would mark the path for a large number of even smaller Technic sets in the future. The front fork can be steered using the handle bars. 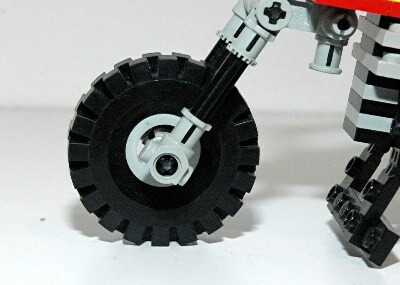 The fork simply pivots around an axle which passes through a steering arm positioned on its side. The handlebar angle and fork rake angle are fixed using toothed connectors. The kickstand can be manually retracted on a pair of standard finger hinges. 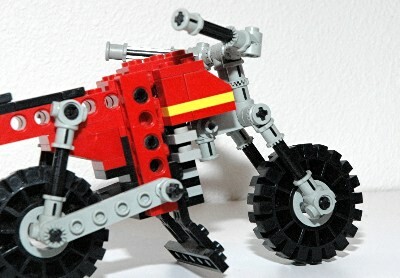 The kickstand is really not necessary since the tires are wide enough to support the vehicle. 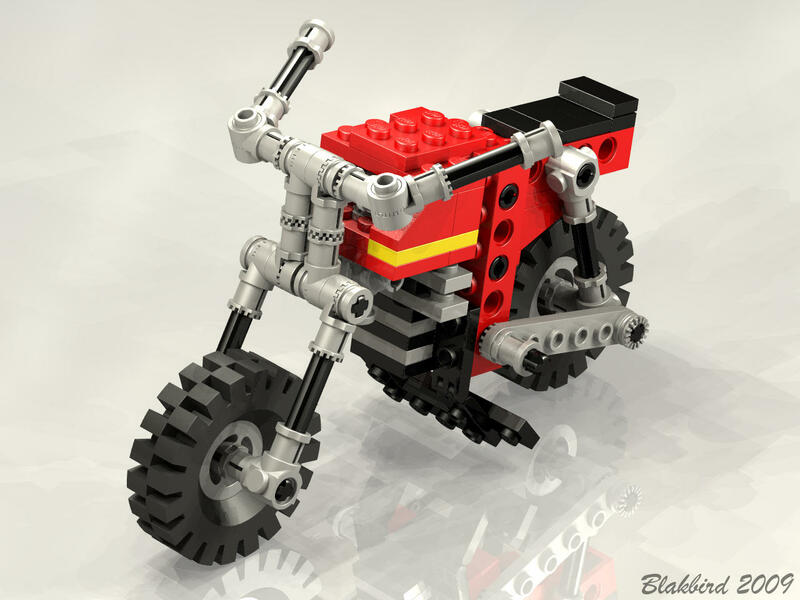 Click for an animation of the kickstand in motion. 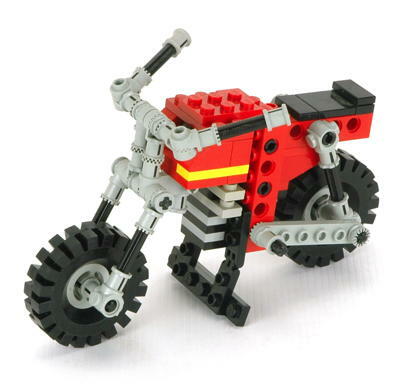 OK, this motorcycle actually does not have any suspension. But it looks like it does! 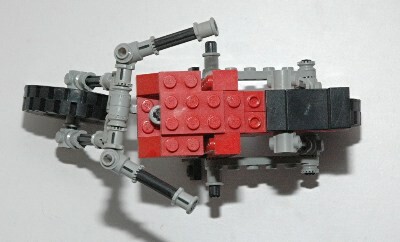 A pair of toothed links represent swing arms, and a pair of connectors and axles look like shock absorbers. 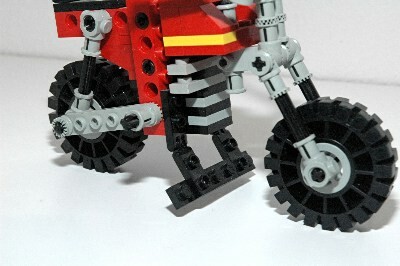 LEGO® could easily enough have used actual shock absorbers here, but they did not for whatever reason. This set uses two rubber 17x43 tires and standard old gray wheels.